Let's hope Barack Obama resists the impulse to move to the center on one of the most contentious issues of the campaign: leaving Iraq. 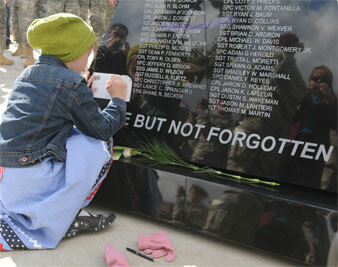 AP Images Iraq War memorial in Alaska. It’s a tradition in American presidential politics that once the primaries are over, both the Democratic and Republican candidates move to the center in search of that all-important centrist swing voter. Let’s hope that this year, at least, Barack Obama resists that impulse when it comes to what is likely to be one of the most contentious issues in this fall’s campaign: Iraq. In fact, we need to do more than hope. Progressives, antiwar activists and, yes, even swing voters–who long ago realized that Iraq is what Obama, in 2002, called a “dumb war”–should demand that the senator from Illinois draw as stark a contrast as possible between himself and John McCain over Iraq. Within the Obama camp, according to insiders, there is a debate about whether and how to do exactly that. Some of the senator’s advisers want him to soft-pedal differences with McCain, in the belief that they can take the antiwar vote for granted. Others argue that, on the contrary, doing so would be bad politics–since it would fail to mobilize the millions of voters who sent a resounding message to end the war in the 2006 election–and bad policy. Two important recent events should stiffen Obama’s spine on Iraq. The first is the stunning (albeit long-delayed) report from the Senate Select Committee on Intelligence, chaired by Jay Rockefeller of West Virginia, a detailed study of speeches and statements from President Bush, Vice President Cheney and other Administration officials during the run-up to the war, in 2002-03. The report compared their statements with the underlying intelligence on a wide range of issues, from Iraq’s nonexistent ties to Al Qaeda, to Saddam Hussein’s nonexistent intention to give nonexistent weapons of mass destruction to terrorists, to various details about Iraq’s nonexistent chemical and nuclear weapons. It’s a damning indictment of the White House’s flagrant fabrications to fuel the war. That’s a document that Obama ought to be reading from this summer. It would express his clear opposition to the US-Iraq pact Bush wants and challenge McCain over his support for it. Even the Iraqis want us to leave, Obama should say. Then he should ask: So why are we still there, Senator McCain?